Yes Virginia There is an “Easy Way”. The Easy Guides are the first step in growing your business The Easy Way. Have you ever spent dozens or even hundreds of hours online researching ways to grow you business and got nothing? Have you spent hundreds or thousands of dollars on advertising only to find that you get calls from stationary supply stores and copier salesman? There is an Easy Way. The companies selling the advertising don’t want you to know about it! It’s simple, if you know how to reach the right customers with less money, they make less money. The advertising sites are in business to make money! To get you started and save you time and money, we created the “Easy Guide” series of books. Written by us, giving you the exact same no nonsense techniques to get your marketing going in the right direction. You wouldn’t build a house without a foundation would you? So why build a marketing plan for your business without one? Of course we are more than happy to help you get your foundation built. If you have more money than time, call us at 949-272-0611 and we’ll get to work for you. If you want to build your foundation without hiring expensive consultants (yes we are good so we are expensive) and waiting to get on our calendar, start with the Easy Guide to Online Marketing and build your foundation yourself. At the Bourquin Group, Online Marketing is our specialty. We know that you started your business to get some freedom in your life, and we also see business owners losing more of their freedom trying to run online marketing and social media campaigns the wrong way. At the Bourquin Group, we want you to grow your business right and find the freedom that you were looking for when you started the business. In order to help even the smallest businesses build an effective online marketing campaign, we have these great books that will help you get your business online and in front of customers without breaking the bank. The difference between a profile and a page. How to build your social media presence for Free! How to get your business online even if you don’t have a website. Spend less time online, not more. 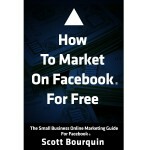 Finally, How To Market On Facebook For Free. If you have a business and want to reach clients in the most cost effective medium available, you will have a hard time beating Facebook as a tool to improve your online marketing. These are the same techniques and checklists we use for our clients. You can get your business up and online in less than an hour after going through the easy guide, and you can have clients helping you market your business to their friends in minutes. That is the power of social media, and Facebook is clearly the 800 pound gorilla of social media. No small business should go without a Facebook presence. It is free and easy to set up, the key is setting it up right so you don’t need to spend hundreds of hours online keeping up with your customers. All of the features of a basic website, blog and forum are all rolled into one with Facebook. 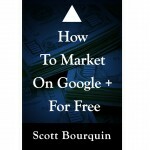 The next step in building a on online presence is Google Plus, so we released How to Market On Google + For Free. While marketing online with Google Plus is relatively new to the world of Social Media Marketing, you can’t ignore the power and reach of Google. If you have a website, playing along with Google Plus and getting your information online on Google’s servers is always a good idea. You’ll learn the correct way to set up a personal profile and build your business information on Google Plus. How to Market on Google + For Free includes a step by step program to get your business on Google Plus the right way in just a few hours. You will also learn quick and easy strategies to share information with your customers on Google Plus that they can share with their friends. Put the power of Google + to work for your business today. 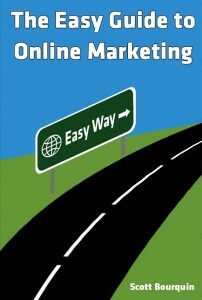 The Easy Guide To Online Marketing This is the new book and includes all of the critical details from the three books above AND it has been updated to included critical new steps to keep up with Googles changes and the growth of mobile search. How to keep business flowing in by giving your customers what they want. (hint, they’ll tell you). How to use Facebook to reach more customers and get them to do some marketing for you! Whichever book you choose, we are sure you will be off to a great start with your business online. If you buy a book and decide to hire us after reading it, we’ll waive your first month setup fee. That could be worth $50 up to $2500. Who else will make you a deal like that? To buy any book on Amazon just click the cover. Now Available! – Add Podcasting To Your Media Machine The Easy Way! The E asy Guide To Podcasting – This is the next step to creating a more engaging connection with your customers. Imagine your own radio show that your customers can take anywhere. This is a no-nonsense guide with every step you need to get a professional sounding podcast online. The only thing you will need is a good microphone and a quiet place to host your show! The exact websites you need and how to set them up to host your podcasts for FREE! Coming Soon – The Easy Guide To Video For Business.